As a friend pointed out, all we hear today is that we are in “uncharted waters” as if something fundamental has changed. We hear that markets are not functioning “normally”, and that the economic crisis facing us is unprecedented. But, has the metaphysical nature of reality changed? Has the nature of man changed? Have the laws of economics changed? I think those laws are functioning just fine[1,2], thank you, as evidenced by the tanking stock market and the exploding gold market. In fact, from a historical, philosophical and economic perspective, we are in highly charted waters. Man's nature as a reasoning being necessitates individual rights and therefore freedom or the protection of individual rights has always led to widespread happiness and prosperity. The systematic abrogration of individual rights by the state has always led to misery and stagnation. This is not new. As I have said before [1,2], the pragmatist mind does not ask such questions. To the pragmatist, there is no nature of reality, there is no nature of man, and there are no laws of economics. There are only “provisional hypotheses” which can change from day to day. To the pragmatist, everything that occurs in reality is literally unprecedented. This is why Obama routinely tells us that he is “not concerned with ideology but facts” and urges us to act, act, act. It is why he can propose economic policies that a five year old could debunk as contradictory and destructive yet receive high approval ratings from the public and especially the nation’s intellectuals. It is why the government stumbles along from day to day, shooting asinine policies from the hip praying that they somehow “work”. It is why Fed Chairman Bernanke can claim he thinks the recession will be over by year end, as if in the midst of trillions of dollars of debt, government nationalization of the banking system, regulations that make the productive into criminals, strangling environmental policies, confiscatory tax rates on virtually every aspect of existence, suddenly it will just all be “over”. As I have said before, even if we are not in food lines and fighting each other over bread rations, in what sense is this crisis “over” [1,2]? The better question is in what sense are we living as we ought to live? Practically speaking, what the American colonists faced prior to the American Revolution was much less confiscatory even factoring in that they had no representation in Parliament. I would bet that if Americans today could return to only the taxes and regulations faced by the American colonists we would consider it to be economic heaven, yet the colonists were willing to go to war over the principle of independence. Today, we face trillions of dollars of government confiscation, debasement of the currency, crippling regulations, a virtual monarchy of executive privileges and powers, and blundering foreign “entanglements”, yet Americans largely blame businessmen for the economy and trust the government to increase its power. That is, the American people are suspicious of and even hostile towards producers who freely offer their goods and services on the open market yet largely supportive of the federal government’s policies which expropriate their incomes and property, monopolize industries, debase the currency, and cripple the economic system. In fact, according to Chairman Ben, the problems are just about over! And when the smoke clears, the government will have plenty of time to prosecute even more regulations against the evil businessmen. What is the difference between an era when men gave their lives rather than pay one cent more to a monarch and an era when men clamor for more regulations and more taxation specifically to pay for reckless government spending (which is the defined purpose of “stimulus”)? 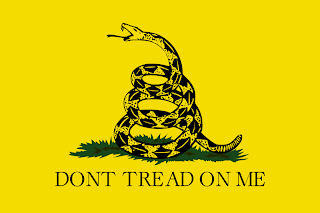 The picture above is the flag designed by Christopher Gadsen during the American Revolution. It represents the essence of the Enlightenment spirit and is a guide to what we need to do if we are to change the world. It is a guide not in the sense that we need people to parrot this slogan but in the sense that what we need to effect is a moral and philosophical revolution. What motivated the colonists was the Enlightenment spirit. Did every soldier in the field understand Locke’s philosophical argument for natural law and unalienable rights or understand how to structure a representative government? The U.S. constitution was not even passed until 1789 (8 years after the British surrender at Yorktown). . Would soldiers have endured the horrific misery of war and risked their lives in order to reduce their taxes by 3.4% or increase their 401K withholding? The philosophical ideas of the Enlightenment intellectuals created a culture in which reason was revered and individualism flourished. The colonists believed they had the right to their own life and to pursue their own happiness. They rejected the principle of monarchy in favor of self-government. “Give me Liberty or Give me Death” and “Don’t Tread on Me” were not just slogans – they symbolized the American ideology of individualism. Although there were many that did advocate negotiating with England, ultimately, the colonists did not settle for compromise. When Parliament repealed the Townshend Act taxes on all goods but tea, the colonists did not respond by rejoicing in their ability to overcome “bi-partisanship” and “get things done”. They responded with the Boston Tea Party. They were not resigned to negotiate their liberty for a bone thrown to them by the crown. They were motivated morally and understood the long term implications of their actions in principle. It is only through the recognition of the morality of individualism that this country can regain its spirit and end this "crisis" once and for all. ""The plan out of the administration with Bernanke's backing seems to have some rationality and the market is factoring that there is something here that might potentially work," said Greg Palmer, head of equity trading at Pacific Crest Securities in Portland, Oregon." This reminds me of the cargo cultists who lined the abandoned airstrips with torches and even put a man in the tower with a head phone on, and they looked at each other and one said "There is something here that might potentially work." But the prosperity never returned. The cultists now trying to run our country. And Ben Franklin was the media of that day.